Set in 1000 AD, a mute one-eyed warrior has been held captive by a Norse Chieftain for years. Used for gambling, the mute warrior is pitted against other men in gladiator fashion. When a slim opportunity for escape appears, One-Eye takes it, slaying his captures and propelling himself into a voyage of self discovery. "Valhalla Rising" is no typical period piece. While the topic of the Cristian Crusades have been detailed before, director Nicolas Winding Refn's account of the content is completely foreign. He uses the Crusades as only a backdrop to weave in and out of the religious sentiments that were apparent during the time. His film instead focuses on a mute, one-eyed warrior and the lives that intersect with him. The historic tale is bitterly grim and extremely brutal, yet it does house a prevailing emotion of serenity. The delivery of these emotions could be quite off putting to some, I however, found them riveting. Director Nicolas Winding Refn masterfully explores a mix of torment, desolation, adventure and bonding within the 93 minute drama. A blend that isn't for everyone but one that most should appreciate the effort. A major point of immersion throughout "Valhalla Rising" stems from Mads Mikkelsen haunting performance as One-Eye. A character that has absolutely no speaking role, Mikkelsen does a superb job of conveying the necessary range of emotion. On the surface, One-Eye looks completely broken, but within he is a bold warrior. Mikkelsen completely embodied One-Eye's barbaric tendencies, calm and collected one second and ready to attack the next. Mads Mikkelsen's portrayal definitely deserves some notoriety and at the very least, left me hoping to see more leading performances from him in the near future. 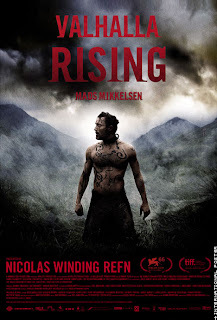 "Valhalla Rising" plays with a delicate balance between dark and light or good and evil. While there is reason for debate surrounding One-Eye's character and soul, the character Are, is very much an embodiment of light throughout the drama. The bond that is silently developed between Are and One-Eye is elegant and powerful. Maarten Stevenson who plays Are isn't given much to do, however Refn's direction and storytelling does a remarkable of conveying the notion of serenity I made previously through the character. Cinematographer Morten Søborg does a fantastic job of capturing the melancholy mood to the story. His vision of the Scottish countryside is immaculate. The cinematography throughout is truly mesmerizing and really adds to the emotion of the explorative journey director Nicolas Winding Refn intended to make. The original music by Peter Kyed and Peter Peter also does a fabulous job of stirring a unsettling mood throughout. There are numerous moments where I found myself awestruck by the raw blend of emotions created from a simple camera angle and/or musical tone. Stuff that reminds me why I love film so much. Ultimately, "Valhalla Rising" is a interpretive film. While I am not so sure everyone would walk away grasping the journey or agreeing on its message, I'm fairly certain most will be stunned by the voyage. For instance, there are quite a few questions to be had in a story that is so detailed but contains very little dialogue. Which doesn't mean there is no development, because there is. Quite frankly, most of the development is done visually or implied, leaving the viewer with only hints to piece together the story. This also leaves the viewer to decode the film themselves. At the same time, the bloody drama also gives glimpses into itself. Refn's story teases the future, if you will, a angle that could disrupt more than engage.